I just got this great timer/stopwatch from Epica. This is a large number display so you can really see the number well. It’s really easy to use. You have two features you can use it as a stopwatch and let the timer count up or you can use it as a timer and set a certain amount of time and let it count down. I use it most with my six year old who still does time outs from time to time. I set the timer on six minutes and I set it close to her time out spot so she can see the timer and watch her time move down. She knows when it beeps and get’s to zero she can come out and apologize and talk about her time out. However, you can use it for a ton of different things, anything that you need a timer or stopwatch for. I love that this one has several different options for how to stand it up. It comes with a clip on the back that you can clip to your shirt or an item but it also has a lock on it so you can even use it as a kickstand. So it can be set up on a table. Very versatile! It works really well and is well made. Whether you’re in the kitchen or in the lab, the Epica Large Digit Timer / Stopwatch’s high visibility display, high decibel alarm and professional quality accuracy make your job easier. For count down (timer) mode, set the minutes and seconds you wish to elapse before the alarm sounds, then press the Start/Stop button. For count up (stopwatch) mode, clear the settings to 00:00 by pressing the Min. and Sec. buttons simultaneously, then press Start/Stop. To stop or pause the stopwatch, press Start/Stop; elapsed time will remain displayed until you clear it. The Epica’s maximum reading is 99 minutes, 59 seconds. The Epica keeps you in the know even if you’re not close at hand. Its 1.5″ x 2.5″ display can be read up to 50 feet away. The alarm is loud enough to be heard in the next room; and it continues to beep for a full minute, unless you manually shut it off sooner. If there’s a delay between when the alarm first sounds and when you get back to the thing you’re timing, you’ll know exactly how long that delay was. After the count down timer hits zero, the Epica will start counting up, until you press the Start/Stop button. I just got this great timer/stopwatch from Epica. This is a large number display so you can really see the number well. It’s really easy to use. You have two features you can use it as a stopwatch and let the timer count up or you can use it as a timer and set a certain amount of time and let it count down. I use it most with my six year old who still does time outs from time to time. I set the timer on six minutes and I set it close to her time out spot so she can see the timer and watch her time move down. She knows when it beeps and get’s to zero she can come out and apologize and talk about her time out. It works really well. However, you can use it for a ton of different things, anything that you need a timer or stopwatch for. It works really well and is well made. I also love that it has a stand on the back of it so I can set it up on a table and not have to hold it. 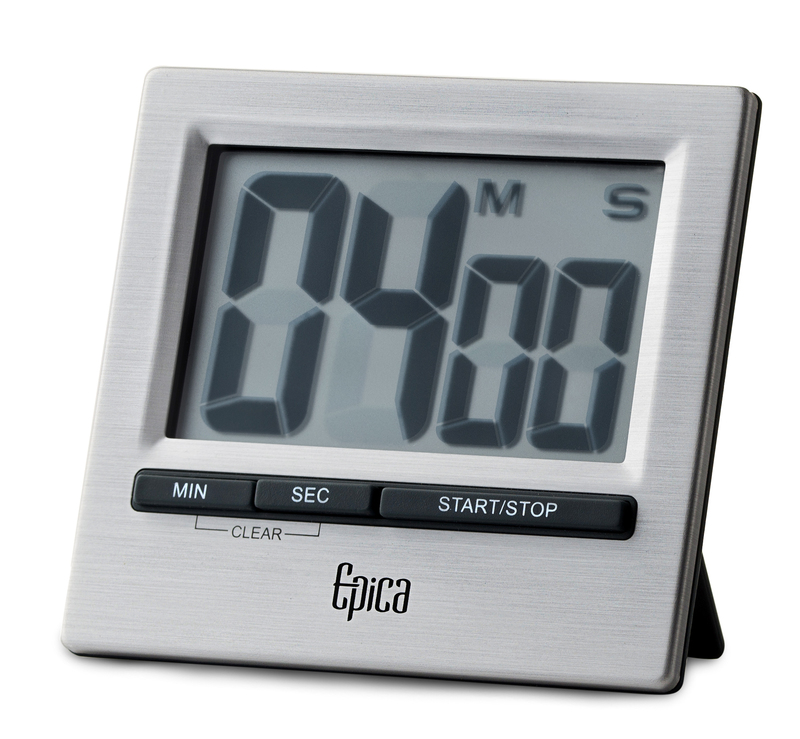 Easy to see, hear and operate, the Epica Large Digit Timer makes keeping track of your time-sensitive tasks a cinch. Plus, it can be positioned just about anywhere you want, from a countertop to a refrigerator door to a wall hook to your belt. To set the timer, just press the M and S (minutes and seconds) buttons until the display reaches the time you wish to elapse before the alarm sounds. To start the countdown, press the Start/Stop button; to stop or pause it, press Start/Stop again. Remaining time will be displayed until you clear the settings (by pressing the M and S buttons simultaneously). The Epica’s maximum reading is 99 minutes, 59 seconds. The Epica lets you know when time is up even if you’re not close at hand. Its 1.5″ x 2.5″ display with extra-large numbers can be read up to 50 feet away. The alarm is loud enough to be heard in the next room; and it continues to beep for a full minute, unless you manually shut it off sooner. You can position the Epica just about anywhere and read it from nearly every angle, thanks to its ingenious 4-way mounting design. The fold-out stand is great for horizontal surfaces such as a kitchen counter or shelf. 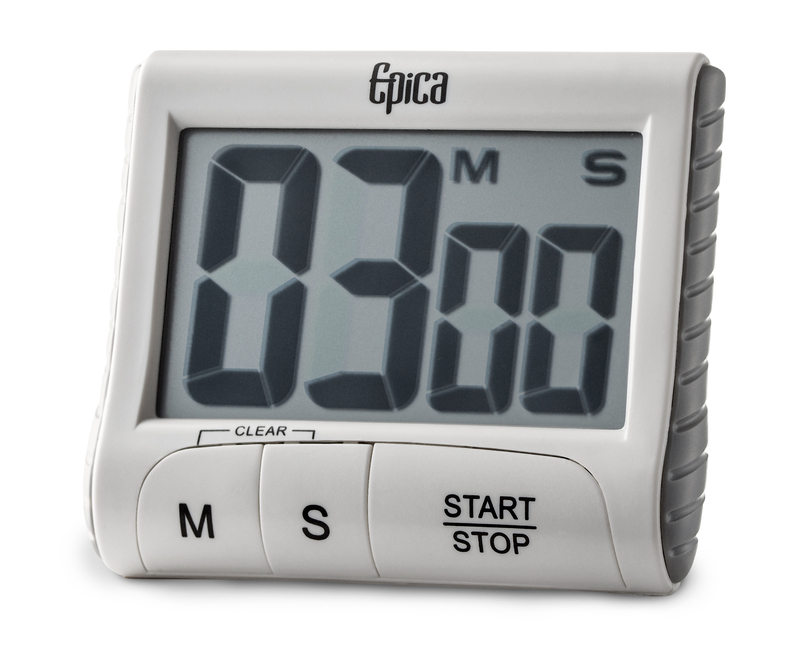 The Epica Large Digit Timer is accurate to 60 sec./month and comes with a 1 year warranty.